After making a wave of appearances on television shows featuring celebrity chefs getting their taste of tarantulas boiled, deep fried or tempura fried, the popular arachnid has been making its rounds on the Instagram accounts of tourists visiting Cambodia. Sought after for its novelty and peculiar taste, the local delicacy has become a coveted treat and familiar offering on the menus of restaurants and pubs, as well as street vendors in Siem Reap and Phnom Penh. Overharvesting of the hairy spider to meet the demand of both, local consumers and tourists has triggered concerns that the species may be quickly disappearing. The local delicacy a-ping, as the spider is known in Cambodia, is becoming scarce and more expensive. Tarantula is a term representing a large group of arachnids belonging to the family Theraphosidae, under which about 900 species have been identified. While it has always been on the fringe of the Cambodian palate, the Tarantula along with insects became a regular part of the Cambodian diet as an emergency food source during the brutal reign of the Khmer Rouge as a way for the population to cope with starvation and food insecurity. After the fall of the regime, tarantula hunting remained an income generation strategy for some rural communities as the demand for the local delicacy continued to grow. Tarantulas are also used in Cambodian traditional medicine and is believed to be good for the heart, throat, and lungs, as well as able to cure back aches and breathing problems. It is also believed that consuming tarantulas can make women more beautiful. Instagram-able moments and tourist demand are not the only reasons for the disappearance of tarantulas. Coupled with the increase in demand is the destruction of their natural habitat due to deforestation. A-ping vendors in the market town of Skuon - also known as ‘spiderville’ as it is famous as a pit stop for tourists looking to try the spider snack on their journey between Phnom Penh and Siem Reap - have been complaining about the scarcity. Long-term vendors of a-ping have been quoted by researchers and the media as saying that they used to procure the spiders from tarantula hunters operating in nearby forests. However, more and more of the forested areas have been cleared and converted to cashew plantations, forcing a-ping vendors to rely on middlemen who source the spiders from forested areas as far away as Preah Vihear and Kompong Thom provinces. 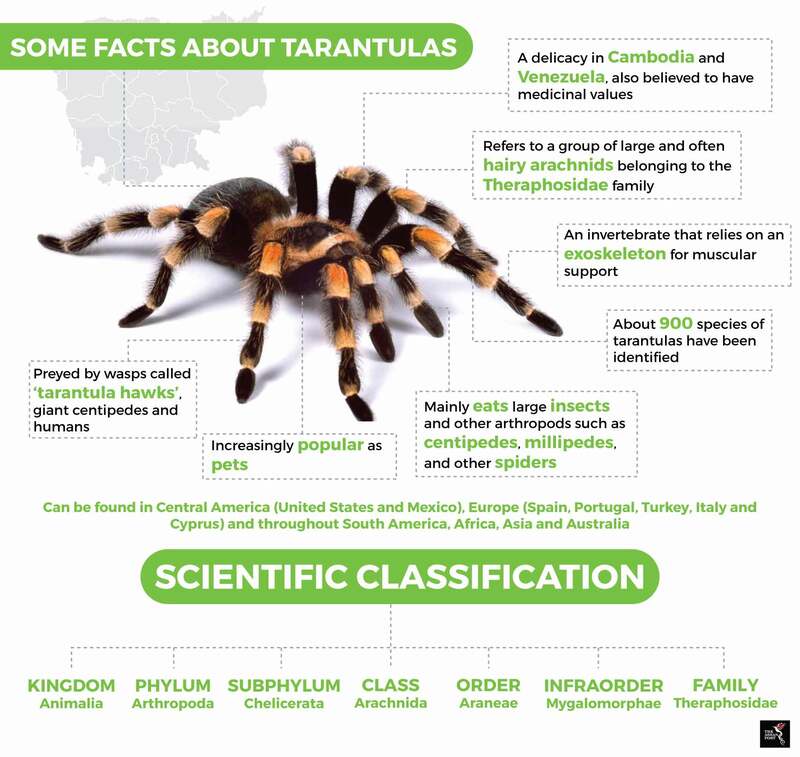 As a result, the price of tarantulas has gone up astronomically in the last decade and a half, from US$0.07 in 2002 to US$0.25 in 2011 and US$1 each currently. A-ping are generally available throughout the year and live underground in tropical forests. A good spider hunter is able to dig up several hundred tarantulas each day and despite stories of tarantula farming, these claims have not been supported by any evidence. According to the non-governmental organisation Open Development Cambodia, the country is losing its forest at a rate of 2,000 square kilometres per year, with seven percent vanishing over the last 12 years alone. Now tarantulas join other Cambodian species threatened by deforestation, which include tigers and duoc monkeys. Undernutrition remains a public health concern in Cambodia, with 32 percent of children under five years of age suffering from stunting, 24 percent are underweight, and 10 percent wasted. Micronutrient deficiencies are also widespread. According to the United Nations Food and Agriculture Organization (FAO), edible insects such as tarantulas contain high quality protein, vitamins and amino acids for humans. Insects have a high food conversion rate and need six times less feed than cattle, four times less than sheep, and twice less than pigs and broiler chickens to produce the same amount of protein. Insects also emit less greenhouse gases and ammonia compared to conventional livestock. As more tourist buses offload their passengers eager to taste the tarantula treat and the destruction of the tarantula’s forested habitat continues, the possibility that these spiders are going to disappear altogether from the local diet grows stronger. If the sustainability of the tarantula trade and ecological implications of its overharvesting are not addressed soon, it is the future children of Cambodia that are going to be the biggest losers.